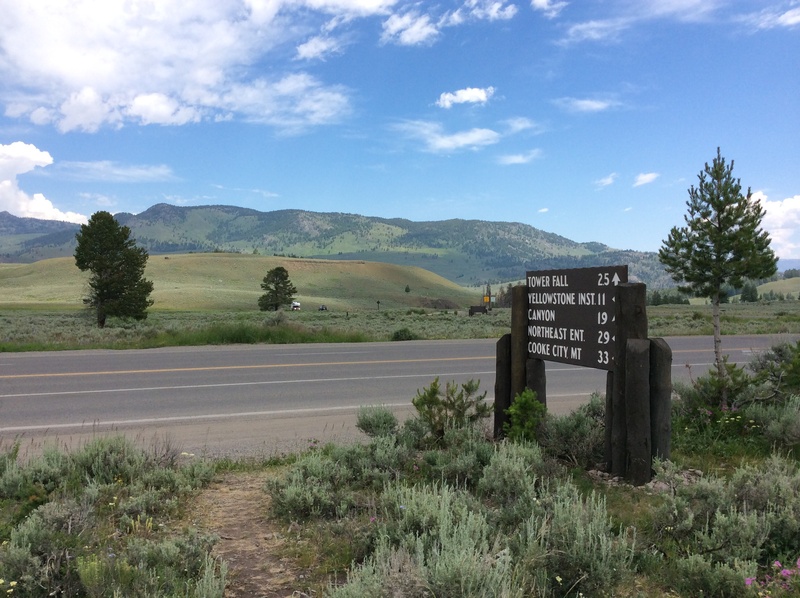 We rolled into the park around 8:20 this morning to do the northern loop: Yellowstone, for those of you not familiar, has a Grand Loop, shaped like a figure eight. Our goal was to complete at least the top half of the figure, maybe slightly more, before the day was over. 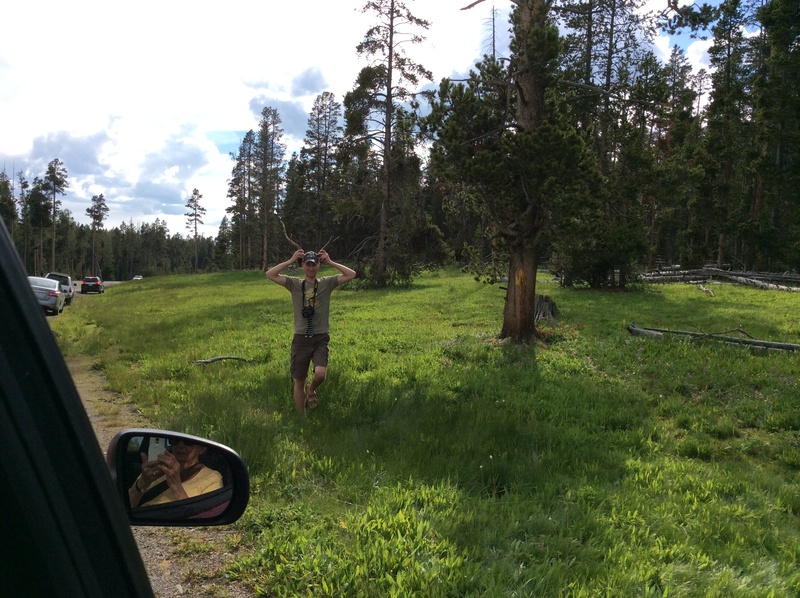 Our guidebook said it was possible to see Yellowstone in a single day, but we weren’t so sure about that. Our first stop was to see a mule deer enjoying some breakfast next to the river. Tim and I gave the mosquitoes a little breakfast, too. 😛 I was too busy guiding Grandmother through a mine field of animal droppings to slap those feasting devils away! Next, we took a gander at Mammoth Hot Springs. What an amazing site–the minerals on this spot make several of the rock formations look like ice. We walked out to an overlook and got quite a view of this lunar-looking spot. 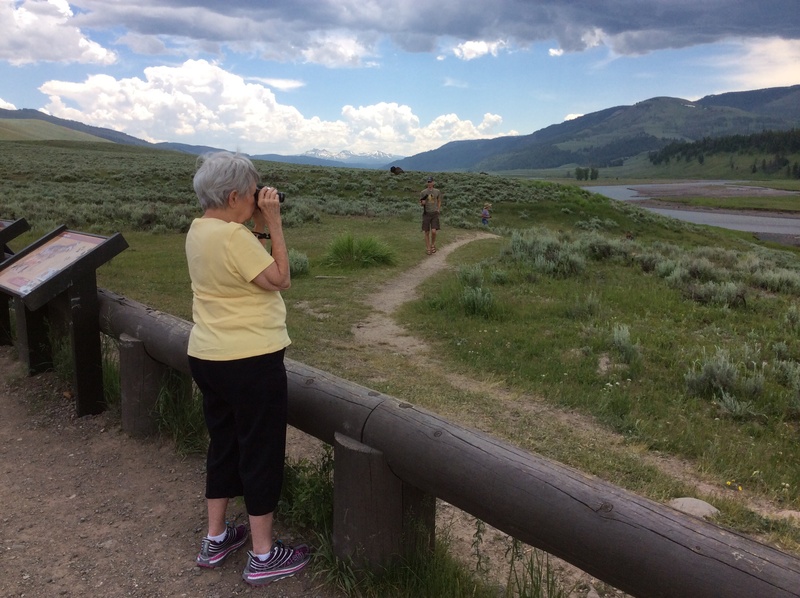 Then we were off to Lamar Valley in the northeastern part of the park. It’s less traveled through there, so we saw fewer cars and more animals. 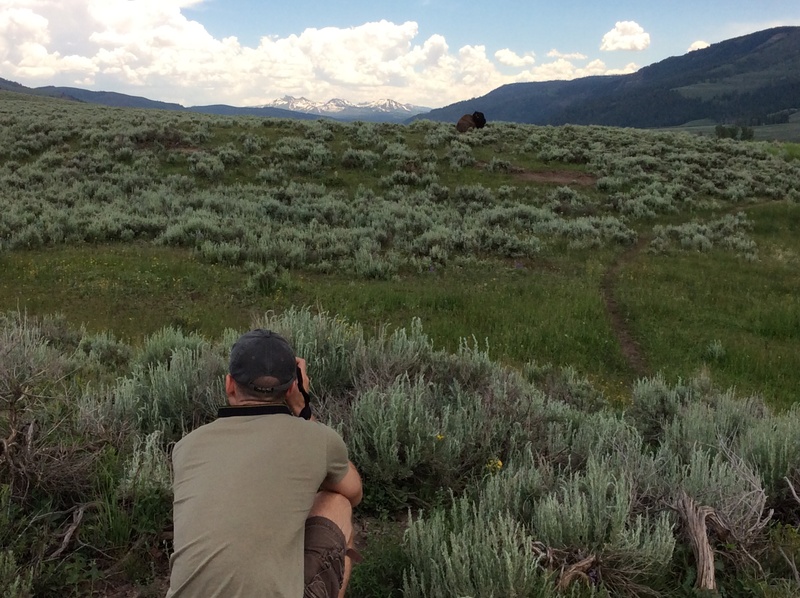 Our first exciting sight was a group of bison drinking, including several little babies. My personal favorite part of this whole vista was a huge bison off to the left of the group on a hill. 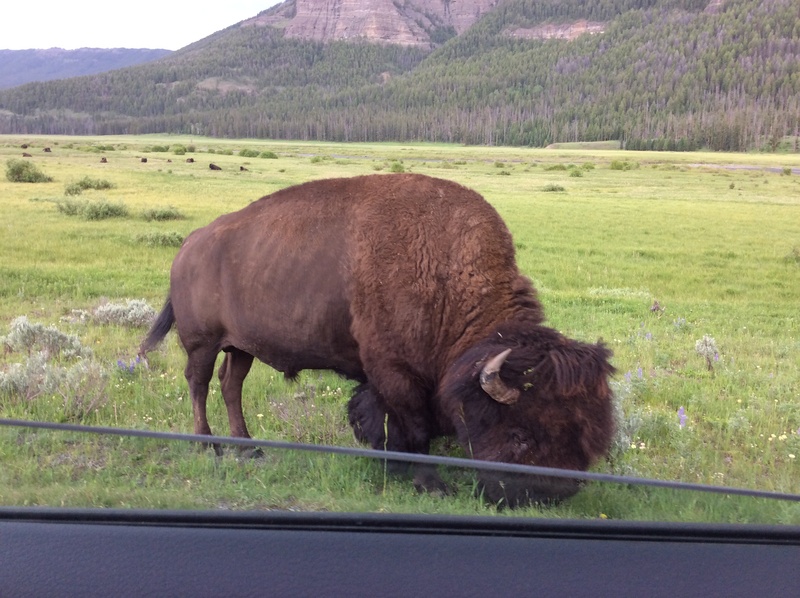 Grandmother said it was like the king bison looking down over his harem. 😉 Tim took some amazing pictures with our camera that are National Geographic quality, I think! 😉 That bison was quite the model! A little further down, we saw close to 100 bison along the river. 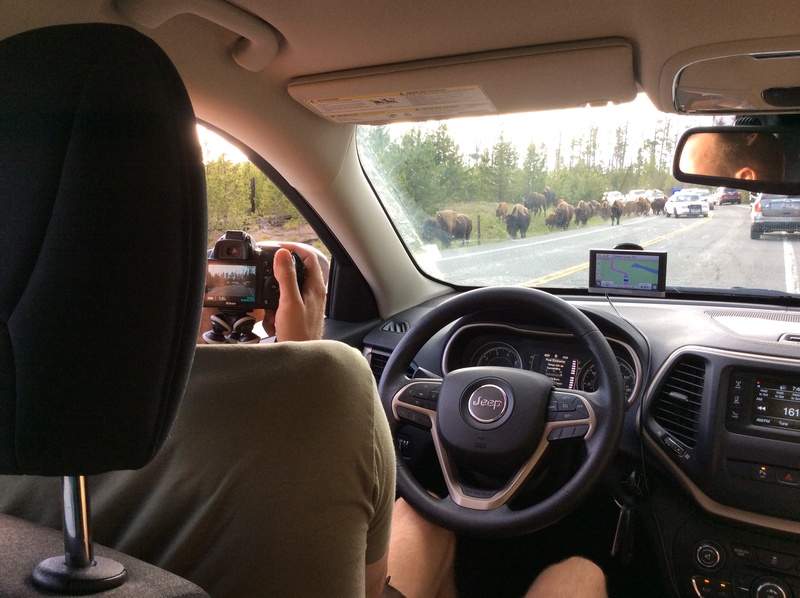 As we kept going down the road, we spotted several close to the road–a couple were close enough that we could have almost reached out and touched them from the car window (but that is completely unadvisable… they had some scary video of a bison attack in the Old Faithful visitor’s center yesterday!). Storm clouds started rolling in, there was thunder and lightning, and a few fat droplets of rain. The views with those dark clouds against the snow-capped range was breathtaking. 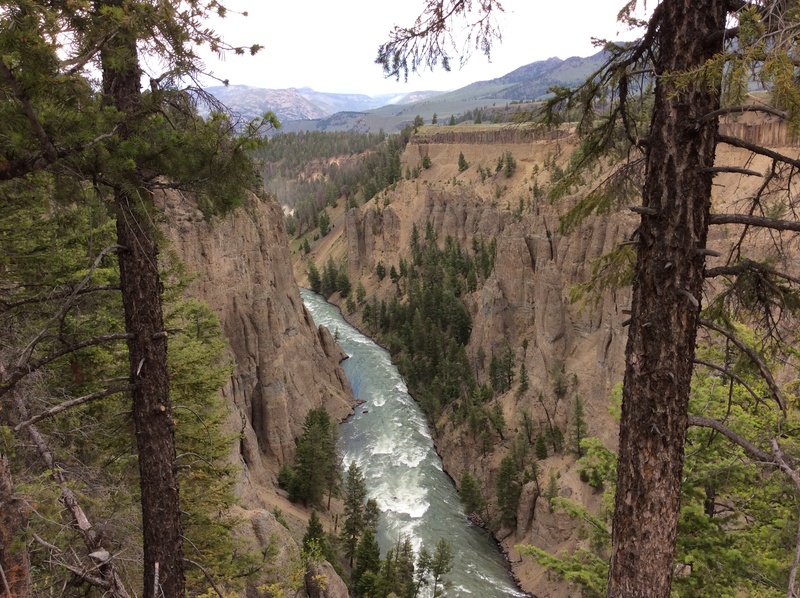 We stopped for a late lunch at Tower Falls and took a peak at the overlook before heading on to the jewel of the northern loop, the Grand Canyon of Yellowstone. Tim, Grandmother, and I stopped at the Lower Falls of the canyon and admired them from a distance. Tim and I decided to hike on down to the brink of the falls to get a better look; Grandmother stayed behind and people/bird watched. It was probably a good thing, because we discovered the hike was a steep and winding one, but Tim and I were rewarded with a really neat view of the falls right where they go over to join the river. Several cars were pulled over to see this rare species. 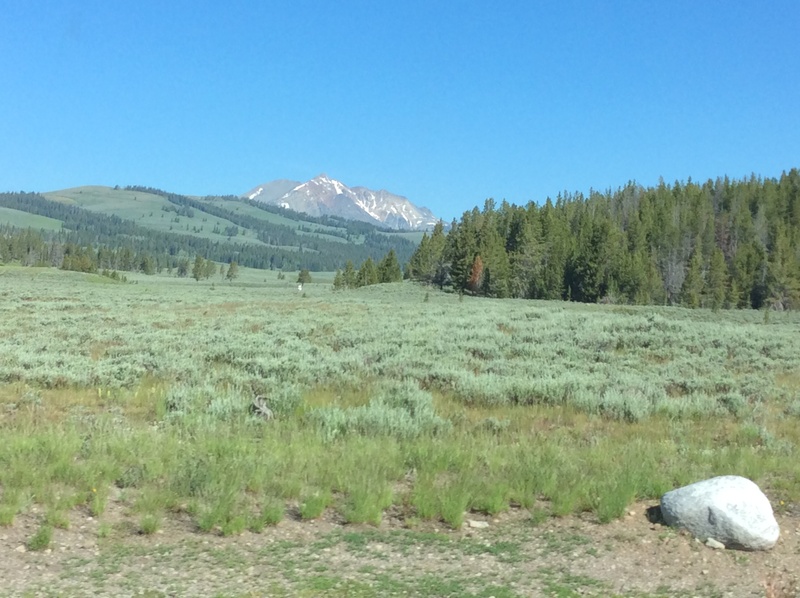 When we started getting low on gas, we turned around and headed back through Hayden Valley. As we were driving back, we noticed a huge group of people on a hill looking at something. There was no place to pull off, so Tim went a little futher, but he said his curiosity got the best of him and he had to turn around and go back. He pulled into the next turnout to turn back. There was a man in a white truck sitting in this particular turnout; I remembered seeing him when we passed before, so I thought he might know what everyone was seeing. This guy had some binos out, and I suggested that Tim ask him what the big deal was before he took the trouble to turn around. The guy in the truck looked a bit like Sam Elliott (a resemblance that Tim confirmed when he got back in the car). Grandmother said he must have been lonely before Tim came along because he struck up quite a conversation with Tim. This was trouble for us because 1) We were low on gas and Tim left the car running and 2) I had to go to the bathroom. I struggled in vain to see whatever everyone else was seeing through the binos in our car so perhaps I could get Tim’s attention, end the conversation, and get to a bathroom sooner. However, Grandmother said she knew it was all over when Tim climbed into the bed of the man’s truck with a high tech bino. I can’t tell you how many times I gasped, oohed, and was completely bowled over by the views today. Grandmother said after one stop that, once again, she shakes her head in wonder at all we’ve seen. Car Story: As we passed Yellowstone Lake, I commented that I would love to kayak there one day. Grandmother started talking about canoeing and how much she loved it, but that she didn’t get to do it often because they didn’t have a canoe when she was young and her dad just didn’t let her. She said her dad wouldn’t ever let her do anything because she was a girl: she couldn’t climb trees, couldn’t go fishing with the boys, couldn’t row a canoe. This vexed her quite a bit and made her wish she wasn’t a girl at all. Someone told her that if she kissed her elbows, she would turn into a boy. She said she wanted to be a boy so badly that she nearly broke her little arms trying to kiss her elbows.